A while back I read on someone's blog (sorry! I can't remember who!) a suggestion for the Holy Heroes Jesse Tree videos. I got it and the kids are really looking forward to watching one each day! I'm not sure if we will make the ornaments, but at least we will watch and discuss. Haley has mentioned a few times in her blog and in her new book about how her family likes to simplify their meals for advent. I liked this idea, so we'll be going vegetarian for advent. 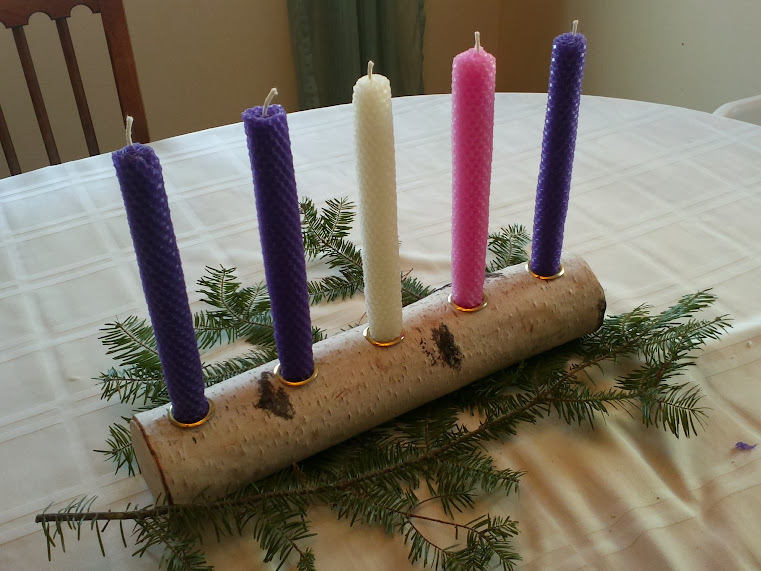 We will light our advent candles every night that we do a family dinner. John has even started teaching the kids a great song that he remembers from his childhood to go along with the lighting! Speaking of advent candles, I am totally loving our advent "wreath" this year! I won the candles in a giveaway from Toadily Handmade Beeswax Candles on Carrots for Michaelmas! It was a candle rolling kit, so the kids got to help craft the candles, which was so much fun. Since I got such awesome candles for free, I decided that we needed a nice advent candle holder in which to display them. After much searching, we found this beauty on Etsy. I love all the textural elements going on, with the honeycomb on the beeswax, and the birch wood holder and the fresh pine branches!